Cut each biscuit in half and slightly roll out (don’t worry about it being round). 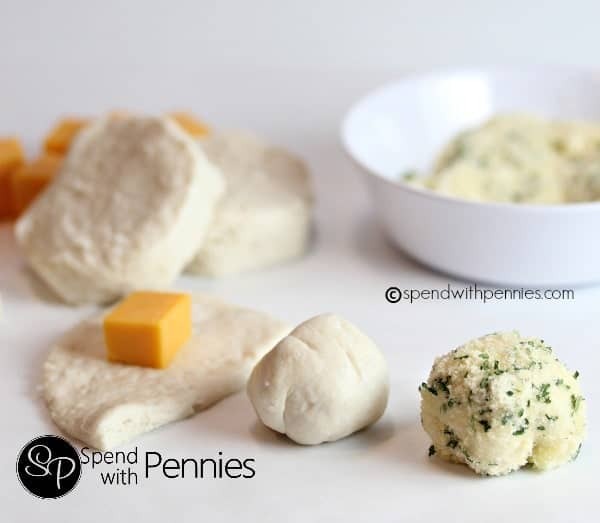 Place a cheese cube in the middle and wrap the biscuit dough around the cube ensuring the edges are sealed. Roll in your hands to make a ball shape. Place butter & garlic in a small bowl and melt in the microwave about 12 seconds. In a separate bowl, combine parsley and parmesan cheese. Dip each rolled biscuit into the butter mixture and then into the cheese mixture. Please on a parchment lined pan. Bake 10-12 minutes or just until browned. Serve warm with crackers, Tortilla chips, or vegetables. See all of our favorite Super Bowl recipes and share your favorites on our Pinterest Page. Stay tuned for our posts throughout February for tips to create your own personal gardens at home!